After a poor run of weather at the end of May and beginning of June, fortunately the weather has improved. While there have been the odd no-sea days, the days on the water have been great. I am happy to say that all of the boats are now working exclusively at the Island and visibility has been fantastic. The sharks have been a little shy and lazy, with gentle passes and not too many close encounters with the cages, but with the excellent visibility everyone saw plenty of sharks. We are loving winter at the moment and I cannot wait to get out again to take more photos. We have now started to run the breaching trips. The first was last week where we were lucky enough to have a full breach on our Decoy. On our last trip out we were unlucky not to have a breach, perhaps due to the excellent visibility. 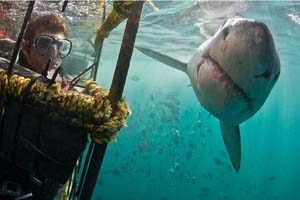 The sharks are very sharp—many times they will approach the decoy but figure out it is not real and not predate on it. The flipside is that when we arrived back to the cage there were sharks already there and we had a great time in the cage with the sharks with the excellent visibility. The whales are here in numbers now. There have not been many spotted in Hermanus but the best place to view them clearly is De Kelders, where I saw over 20 whales wallowing around in the calm waters the other morning. This place is the ideal getaway to visit when coming to South Africa. Choose the Dive & Stay option or any of our other packages to see both the Great White sharks and the whales with our spectacular guesthouse, the Roundhouse! The breaching and predation trips are going well with multiple breaches on most trips. To do the ultimate Great White Shark Package choose the Best Of Both package which combines the fantastic Breaching sharks at Seal Island in False Bay with the great Visibility in Gansbaai and many, many Great White Sharks! We are still seeing Seven Gill Cow Sharks at the dive site, which offers great visibility as it is protected by the winter storms. Should you be booked on your dive in Gansbaai and the trips get cancelled due to the weather, always contact us to see if we can either get you on a larger boat or on one of the boats in Simons Town for the breaching trips or Cage Diving trips. The Cape Peninsular protects Seal Island from the rough seas and unless the weather is very poor we can get out in the winter most days. Mossel Bay is still teeming with shark activity and successful trips to sea regardless of the weather. Fortunately, Mossel Bay is facing away from the winter westerly winds so the bay is calm during the winter storms. If you are available to drive the additional 3 ½ hours up the coast or are heading up the Garden Route, we can get you on the boat. We are seeing many Ragged Tooth sharks on our dives at Aliwal Shoal. The main focus is with the Sardine Run further south and most of the operators have moved down the coast to catch the action. We can still get you out on the water with the sharks at Aliwal Shoal, however, if you want to see plenty of Black Tip sharks as well then we are able to organise dives and cage diving. All boats are now operating at Port St Johns for the Sardine Run, with last week the opener to many bait balls and activity. The water temperature has dropped to 18c which is an ideal temperature for the sardines to come to the surface where we can dive with them and follow the abundance of predators. The weather has not been too bad and the boats have been on the sea most days. There are still last minute spaces going for the sardine run for those wanting to join in. It is advisable to do at least 7-8 days Sardine Run due to the fluctuation in the activity and weather but if you are unable to then we will be able to also get you out on individual days.